Summer is right around the corner! Here’s a fun idea for a bulletin board. 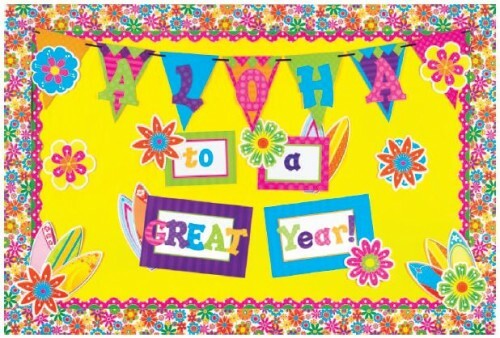 Mix your spring and summer accents to create a bright end-of-the-year Hawaiian style bulletin board. Use yellow paper for the background (or any other brightly colored paper). Layer the sides with Fun Flowers Straight Border Trim, Green Scalloped Border Trim, and Hot Pink Polka Dots Scalloped Border Trim. To create the Aloha banner, grab a thin piece of ribbon and string it along the pre-cut holes of the Sassy Solid Pennants. Use Multi Bright Sassy Solids 3″ Letters to spell out “Aloha” on the pennants. Add four pieces from the Sassy Dot Hearts Create & Decorate Set in the middle of the board, and use the rest of the Sassy Solids Letters to spell out “to a Great Year!”. Finish off with Fun Flower Accents & Surfboards Accents. To personalize the bulletin board more, have each student pick their own surfboard to put on the bulletin board. They can write their names and add stickers to make the surfboard completely their own.